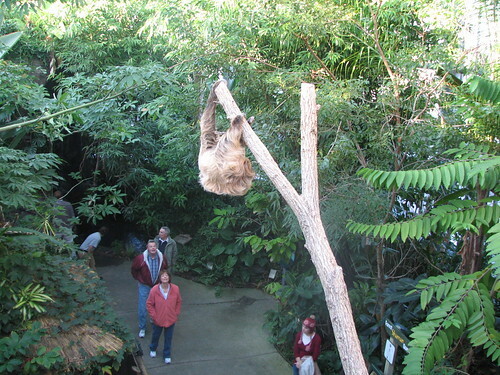 Sloth: A disinclination to action or labor. 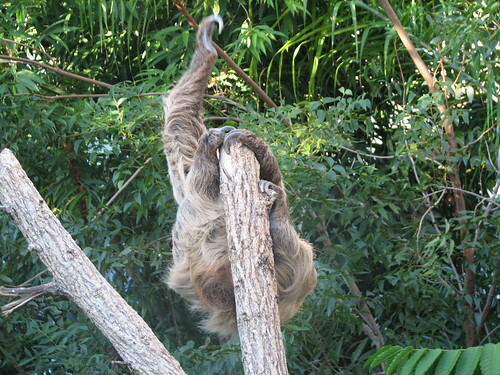 As in: The deadly sin of sloth. Spiritual inactivity. So true, Friedrich Nietzsche, so true. Overall, sloth isn't considered a positive attribute at all. 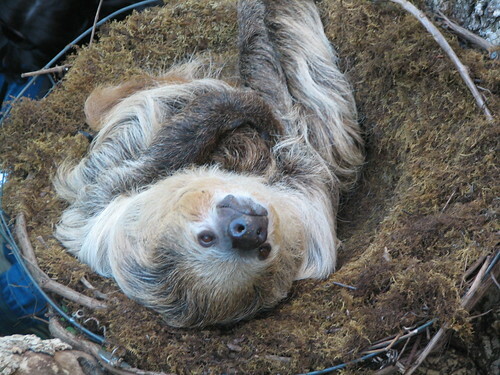 So, consider the poor animal crowned with the name sloth. You'd expect it to be the sort of animal that might be on the dole, not pulling it's own weight in the wild kingdom. Only showing up when there's food, like your great uncle or that shiftless cousin. Cute? You don't expect cute. 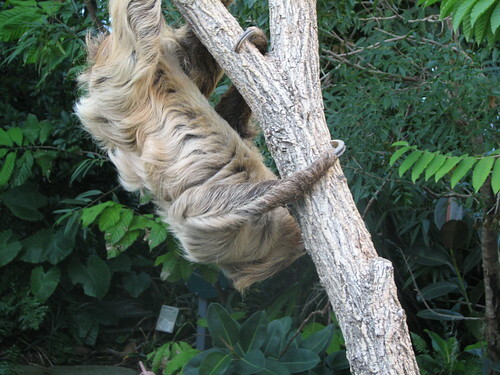 They are ancient animals, dating back millions of years, when there used to be sloths the size of elephants. They have highly specialized, heavy-duty claws. They live upside down (I often feel like that myself) in the forests of South America. They can actually sleep hanging upside down from a tree branch. As someone who can sleep nearly anywhere, I'm impressed. 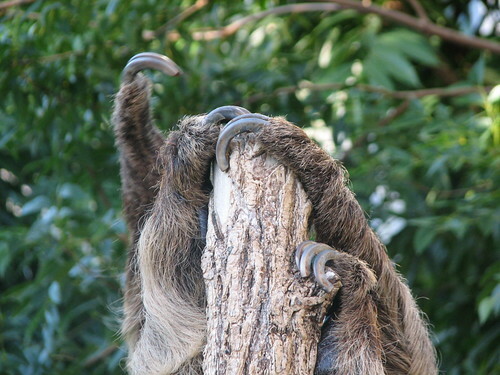 Sloths have slowwww metabolisms, so they digest food slowwwwly and move very slowwwwy. So the name isn't a slander against their character after all, it's a "medical condition." Despite being nocturnal, I got to see Mo climb to the top of her tree. Verrry Slowwwwly. 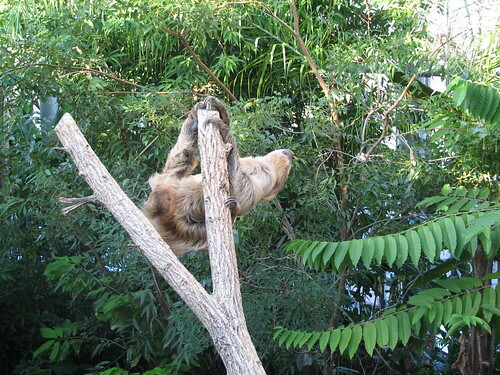 And do some Sloth Pilates. You are wondering if I'm in the tree with her aren't you? How else am I getting shots from this angle? It was actually a little nerve-wracking to watch her trying to get a good hold. She never once looked at what she was doing to see where to grip. Ah. Back in the nest. Whew. What a workout. Mo says whatever, Benjamin Franklin. PS to Nashville - Speaking of adorable furry animals, Sesame Street Live is coming this weekend. Use the discount code ERNIE for $3 off each ticket. Bear can't wait to see Elmo! Click on the 1-2-3 Elmo button on my sidebar for more information. I had know idea and now I know! But seriously how did you get those pictures at that angle? There's a really hearty laugh? Imagination - Thanks. And way to work that plug in there. Frau - I'll never tell. 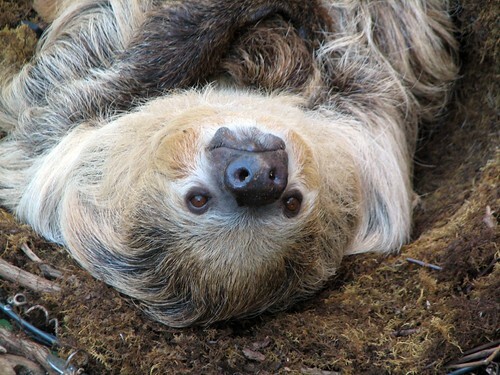 And who knew sloths were so cute and sort of fascinating? So adorable and yeah, I am still not sure how you took those photos! Cinci?? I wish I had known...I would totally have stalked you at the zoo...we're close by! Margaritas next time!!! She IS cute! Thanks for the Sesame Street Live info. Maybe I will run into you in Nash Vegas one of these days! 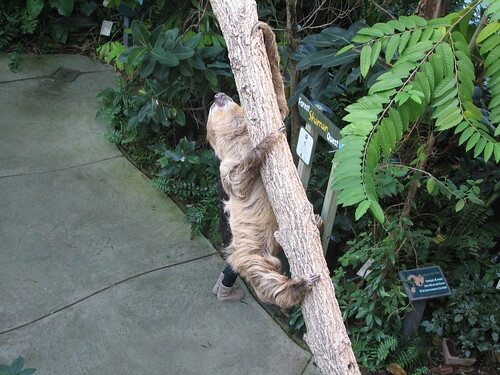 When I grow up, I want to be a sloth. You did get some great shots! Two facts I find interesting about sloths are that they can swim and that algae grows on their fur and acts like camouflage. Sloths the size of elephants? Wow. evenshine - I wish I'd known! I'd love to meet you. Next time for sure. Rebecca - I knew about the swimming but not the algae - that's pretty cool. Though Mo looks like she has very clean fur. 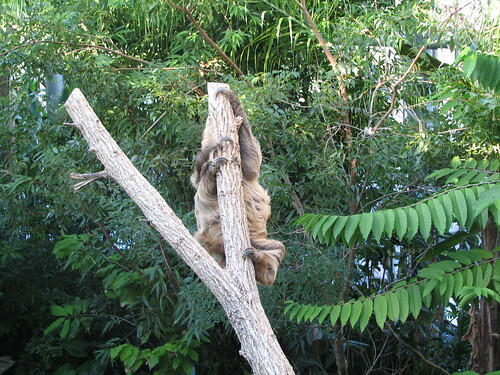 I learned ALL about sloths when Sam was in his rain forest stage at age 4. But yours is the cutest one I've ever seen. 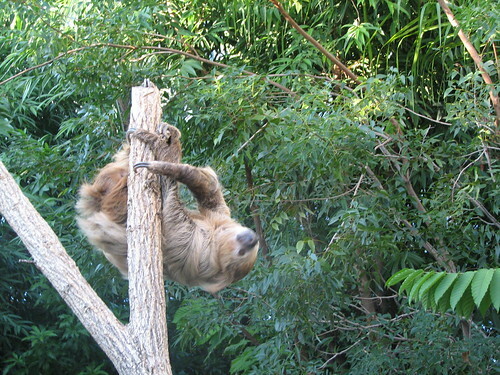 I once saw a sloth in the wild when I was hiking through the rainforest in Peru.